Echo360 has acquired education startup ThinkBinder, a social study service, to integrate into its lecture capture application. Once the integration is done, students at schools using Echo360 technology will be able to create groups with which to share notes and other digital resources, chat via text and video, work together on a collaborative whiteboard, and maintain group calendars and files. ThinkBinder is designed to encourage collaboration through shared notes and resources, text and video chat, whiteboards, calendars, and files. About five months ago, in November 2012, the company also acquired LectureTools, which has a number of features. Instructors can add interactive activities into PowerPoint slideshows and invite greater participation by students in class through a laptop and smartphone device response system and by allowing them to submit questions digitally. 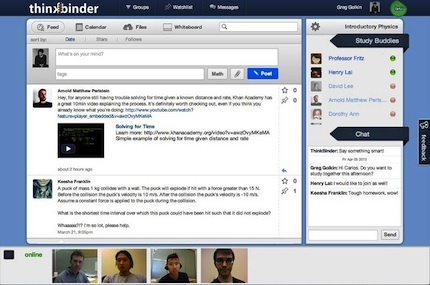 "The acquisition of ThinkBinder brings the best of social media to the Echo360 'active learning solution.' Students benefit with crowdsourced learning while instructors can participate and monitor as needed," said Echo360 CEO Fred Singer. "This drastically improves an institution's ability to enhance the experience for on-campus, distance, and even [massive open online course] students by creating a connected and collaborative online learning experience." "Together, Echo360 and ThinkBinder add a contextual conversation to the content, transforming the once passive viewing experience into a dynamic, social, and engaging learning opportunity," said ThinkBinder founder Greg Golkin, who has been named head of platform innovation for Echo360. Echo360 said in a statement that its technology was in use in 500 institutions around the world. Adoptions in the last year have occurred at Canada's University of Toronto as well as the University of Nottingham and the University of Exeter in the United Kingdom.